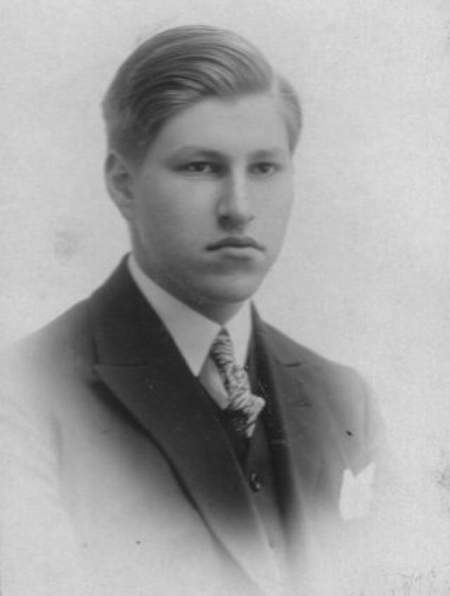 Alexander Jozef Stibbe (born on 28 April 1872) was one of the seven children of Phinie David Stibbe (from Kampen) and Rebekka Ali Cohen (born in Meppel). She was a sister of the famous hygienist Levie Ali Cohen. The other children were David, Adelgonda, Alexander, Elisabeth, Wilhelmina and Estrina. Phinie David had a bakery in Hoofdstraat. In 1887 he sold it to his foreman Elias van Geens and he himself became agent in colonial- and grocery goods and bakery articles for various factories and trading houses at home and abroad. He was a man of authority in the Jewish community in Meppel, so he was on several boards. He has also become legendary by a saying ‘you know what Stibbe said’. This had its origin in the fact that he accompanied a refusal with the words: ‘No way, damn you’. 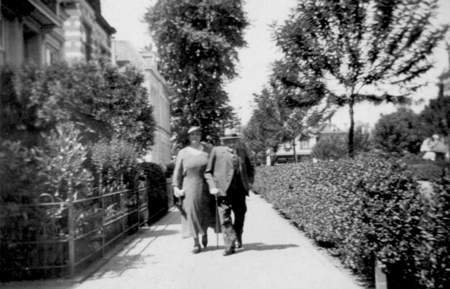 On 30 July 1909 Alexander married Martha Löwenstein at a registry office in Cologne. She was born there on 14 September 1879. The church wedding was the next day. There is still a Heiratsurkunde of the first ceremony and a Hausstandsbuch of the second. Alexander continued the business, but his weak health compelled him to sell it on 1 January 1928 to an employee, Mr. G. Heeres Jzn. From the letters he sent to his clients appears which companies were represented by the firm of Stibbe, e.g. Stearin Candle Factory Apollo, Rice-husking plant Albert Vis and Van Schaardenburg & Co, Oil factory Calvé, Cocoa factory C. Kamphuijs plc., Zwaardemaker’s Trade and Industry, Candy factory the Gilse Brothers and Methylated Spirits Sellers Bergen op Zoom-Delft. Alexander did not retire completely: ‘I will continue the Insurance Agency in the same way under the old name ‘the firm of P.D. Stibbe’. Apparently he also traded in insurances. We may assume that the period between 1928 and 1940 was without any problems for them. The only things we have from that period are two passports, dated 6 July 1939. It gives a nasty taste when you read that the documents were valid for ‘all countries in the world’. That would be totally different one year later! I, the undersigned, S.Adr. de Jong, doctor in Meppel, declare that Mr. A.J. Stibbe, born in Meppel on 28 April 1872, has had a serious curvature of the spine since his youth, which compels him to wear an orthopedic brace in order to be able to move around properly. Because of this he has had a heart condition for more than 16 years, which has grown worse the last few years, so that he needs bed rest and has to avoid the slightest exertion. By this his legs are swollen and he has difficulty in breathing. He also suffers from angina pectoris, his blood pressure is too high and he has hypertrophy of the prostate, so that he has to be catheterized several times. As a result of all this he is an invalid and has to be looked after and nursed night and day, which is done by his wife. This delay caused a lot of unrest. There was this grueling uncertainty whether they could stay in Meppel or would be taken to Westerbork still. In April 1943 trouble began with a letter from police inspector Breedveld to the commander of the SS und SD in Assen. It said that among other things that Mr. and Mrs. Stibbe were still in Meppel. This letter was a reply to a telegram sent by Dr. Sellmer, the Beauftragte (Commissary) for the province of Drenthe, to the mayor of Meppel in which he requested to report to the Sicherheitspolizei (security police) which Jews were still in Meppel. It so happens the government commissioner had decided that there should not be any more Jews in Drenthe and other provinces. For the time being Mr. and Mrs. Stibbe got permission to stay in their house but the security police kept a close watch on them. The regional police president Mr. Y. de Boer also wanted to be kept informed about the Stibbe family. Mr. and Mrs. Stibbe during a walk in Stationsweg. The support the family got in Meppel was of no avail. At the beginning of September Mr. Breedveld got the order that the Stibbe family had to be taken to camp Westerbork; in an ambulance and with the proper food. Policeman Rondhuis had to deliver this awful message. Mrs. Stibbe had always said that they would not fall into the hands of the Germans alive: ‘If we know when the time has really come’. As far as my parents are concerned, my father had been ill for a long time. When Meppel was ‘vacated’ by the local police force he heard about this and managed to convince the policemen that he was too ill to be transported (October 1942). 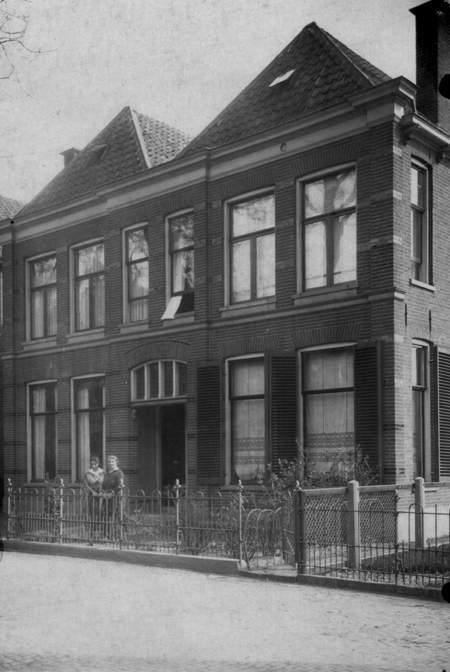 On 24 December 1942, some psychiatric patients were to be taken to Apeldoorn and I knew they would pass our house. I requested to be their attendant and asked the attending military policeman to drop me there and pick me up on their return. In the evening mother had prepared a tea for a very mixed company: three military policemen, some Jewish nurses and us. As far as I know, they stuck it out without any great problems till 9 September 1943, when the new fanatic chief of police announced that they had to be transported to Westerbork the next day, if necessary by ambulance. They then executed the plan they had had for a long time: to put mattresses in the kitchen, to take a lot of Soneryl® and open the gas tap (the carbon monoxide poisoned them). When people came to fetch them the next morning they were unconscious; father died at 10.00 and mother at 16.00 hours. The Germans in Assen ordered to transport them anyway that morning, but the police reported they had died. Order: to be buried the following morning at 7 o’clock. This was done at the public cemetery in the company of some friends; our neighbour, the Remonstrant clergyman Mr. van Nooten said the Lord’s Prayer. Friends have seen to a stone with inscription. In W. I heard from the driver of the laundry Top from Meppel, who came there regularly, that something serious had happened; the next day I received a telegram from their G.P. and a few days later a short farewell note arrived, written by both of them with a steady hand . Of course I accepted their decision, for in W. I would not have been able to do anything for them. 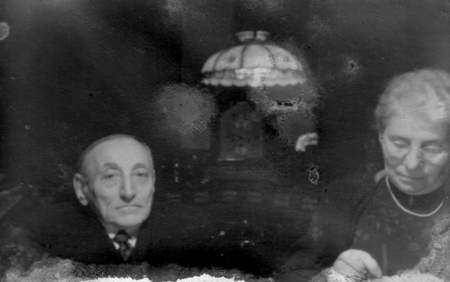 The last picture of Mr. and Mrs. Stibbe, taken in 1942. It was the couple’s wish to be buried at the Algemene Begraafplaats (public cemetery). It is said that they wanted to have their final resting-place among the inhabitants of Meppel, who had supported them so much. Many people paid these brave people their last respects. The funeral had to be done in a hurry, before the Germans realized what was going on. The undertaker’s man would say later on: ‘I have never taken away a dead body that was still warm, but everything is possible these days’. Das Ehepaar lebte in Wohlstand, doch das ganze Kapital war an die Bank Lipmann Rosenthal & Co. überwiesen. Im Hause wurde kein Geld vorgefanden, weshalb die Gemeinde Meppel einsweilen die Spesen der Beerdigung in Rechnung stellte.